Visiting the seaside on a warm summer’s day is a quintessential British pastime and tradition. When the warm weather starts and the sun begins to shine, South Devon’s towns and villages near the coast are inundated with visitors from both across the UK and abroad. This often means that these coastal retreats are much quieter outside of the peak season, so if you’re looking to avoid the crowds then we would suggest looking to visit outside of the summer time, perhaps even in winter! If you and the family are heading down to spend some in the idyllic town of Dawlish and aren’t visiting in the peak season, then there may be one or two rainy days, but not to worry, as Dawlish has a whole host of things you can get up to when it’s too wet for the beach. A trip to a seaside town is never complete without heading to the amusements! If you’re visiting Dawlish, you have the choice between Harrisons Amusements in the town of Dawlish or you can head to the Pavillion Amusements in Dawlish Warren. Both are under cover and will provide you and the kids with hours of entertainment. Less than ten miles down the road from Dawlish is the seaside town of Torquay, home of the Kents Cavern. This attraction dates back to the Stone Age and is billed as one of Britain’s best showcaves! The tour around the cavern takes you back in time to when the space was used by ancient humans for shelter. The humans spent time in the cave and made fires, shaped tools and hunted ice age animals. The tour gives extensive insight into the history of the cavern and will make for an unforgettable holiday experience. Also located in Torquay is the Living Coasts Zoo & Aquarium, an innovative zoo and aquarium located on the coast. The attraction offers visitors the chance to take a journey around the coasts of the world to see amazing animals in naturalistic habitats. As well as being an attraction, Living Coasts is also an education, scientific and conservation charity. It prides itself on being dedicated to protecting the global wildlife heritage and plays the role of inspiring respect for animals, plants and the environment. 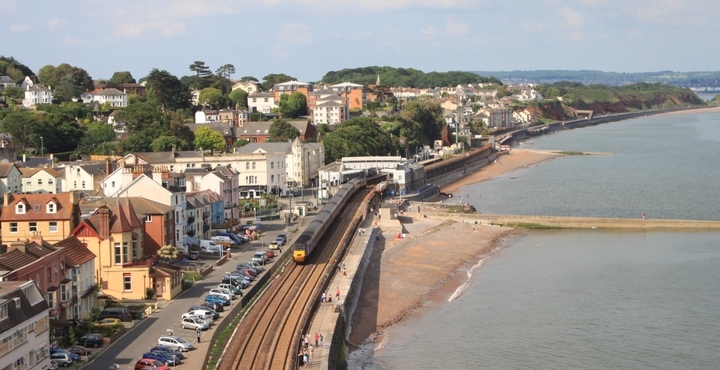 Both Dawlish and Dawlish Warren have train stations and regular trains can be caught to take you either north or south of the area. If you’re heading north, you’ll follow the coast through Starcross into the city of Exeter; here you’ll find a great range of shops and both outdoor and indoor activities. If you choose to head south, the route will take you into Teignmouth, then into Newton Abbott and eventually Torquay. Day Ranger passes are available on the National Rail network which will allow unlimited train usage for one day, meaning you can hop on and hop off at any stop that takes your fancy! Perfect for those rainy days spent in Dawlish Warren, The Paint Hub is a place where adults and children alike can express and indulge their creative side by designing marvellous creations. Offering a fantastic pottery painting experience, The Paint Hub has a diverse range of shapes and figures to choose from, with heaps of examples to inflame your imagination. If you want something to take home that very same day, they also offer a teddy bear building service which you and the kids can use to create a perfect holiday souvenir! Hopefully, this article will inspire you to head to the wonderful South Devon coast on your next family adventure. If you’re looking for hotels near Dawlish, then why not check our availability? You can check online or give us a call and we’ll be happy to help!